I used to think watches were completely unnecessary and stupid. After all, my cellphone is always with me and is always synced to the right time. Why do I need a watch? I bought it a few months ago from amazon.com. Evidently it's imported by Mister Watch from Japan. Sure enough it came in the mail, complete with price tag (in yen) and a Japanese-only user's manual (G-Shock is made by Casio, a Japanese company). Because I don't read Japanese it has been difficult to discover all of the features of this watch. The "movement sensor" that I described above is a good example. I was out with my friends one night in a dark bar and I lifted my wrist to look at the time. The back light automatically came on once I twisted my wrist a certain way. At first I thought it was a fluke. My friends were convinced I was somehow controlling it with my wrist, mind, etc. Oh no, it was the movement sensor. I think it works in combination with the solar panel because it only activates when it is dark (beyond a certain point). In a dark enough room, with just the right wrist snap, I never have to manually push the light button to see what time (or temperature) it is. That's a good thing too, because like any good American, I don't want to have to do ANYTHING that I shouldn't have to do and pushing watch buttons is no exception. It's too bad that you can't get them anymore because many, many people have asked about the white G-Shock. If anyone knows where you can get them in the US please let me know! UPDATE: Shinya Amano has translated AstLinux documentation for voip-info.jp and he has done some research on this watch for me. He found the English manual. Thanks Amano! Finally a post i can understand!! I must admit that I covet your watch Kris. 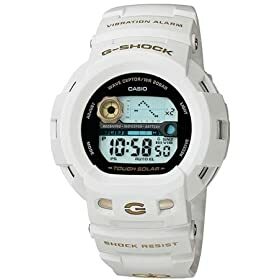 If anyone does know where to get a White G-Shock, i would like to know was well. Then we would have to coordinate when we were going to wear them out so that we could match!